I grew up in a quintessential New England middle class suburb. The neighborhood was at war with weeds, silently competing for the loveliest, greenest lawn. As a kid I was discouraged from picking the very attractive and fun dandelion seed heads and blowing them into the air (I would have been aiding the enemy, after all). You can imagine my surprise when I learned as a young adult that dandelions, purslane, and other “enemies” were in fact very tasty and nutritious. Shaw’s foraging section is not just about wowing you with all the weeds you can actually eat. Instead, he delves into a small collection of plants that are accessible, abundant, and perhaps unexpected and tells you how to prepare them exquisitely. Wild greens ravioli, pickled sea beans, and madrone bark tea eggs are unique preparations from seemingly ordinary plants. Living in an arid part of the country I initially feared that Hunt, Gather, Cook wouldn’t feature any plants that I’d easily be able to obtain. At first glance the desert Southwest doesn’t appear very forager-friendly. 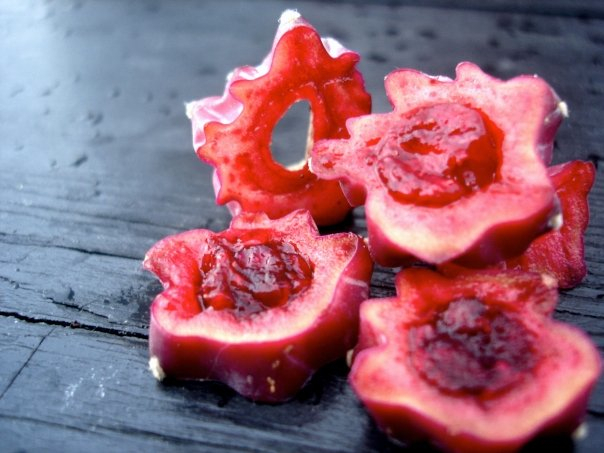 But I can happily report that locally abundant prickly pears (“little flavor grenades”) are one of the stars of his second chapter “Fruits and Berries of the Wild”. Manzanita berries make an appearance, too. When Shaw says he wants to cover “Foraging from Coast to Coast”, he seems to really mean it. Pictures I took of a prickly pear fruit years ago, before I knew what to do with it. Acorns are available here in Southern California as well, which is exciting because “Acorns: Loving the Unloved” was a standout chapter in the foraging section. Shaw walks the reader through the somewhat labor intensive process of shelling, leaching, and roasting acorns in a way that doesn’t downplay the time involved but also doesn’t make it seem like an insurmountable chore. (Shelling 10 pounds of acorns during a college football game without missing a play? I could get behind that!) 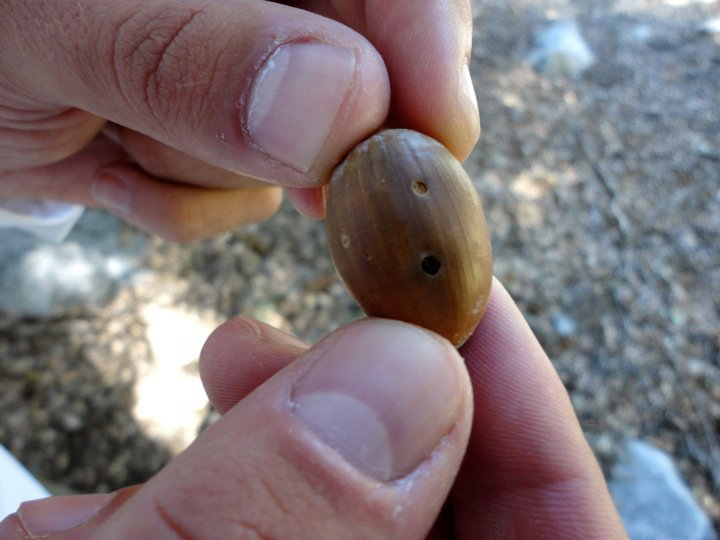 Given that some varieties of acorn are more worth your time than others and with so many oak subspecies in the U.S., you will definitely need to bring a good plant identification guidebook along on your acorn stashing adventures. Honestly, the same can be said for all other foraging endeavors that Shaw recommends. While he provides descriptions of each plant he features, as a beginning forager I would not rely on these descriptions alone. Invest in a good reference text and double check your wild plants before you start devouring them with abandon. An insect already beat Nick to this acorn. The foraging section is capped off by a detailed, highly educational chapter on turning your gathered treasures into wine. Ever thought about making those vibrant yellow dandelion flowers into a bright, floral wine? I surely hadn’t. And while it’s unlikely that I’ll attempt such an endeavor any time soon, I have an expanded view of what is possible. From foraging Shaw moves onto fishing and aquatic gathering. He starts by offering forthright and time tested tips on finding, gathering, and preparing shellfish. Recipes are intermingled with childhood stories of hauling in buckets of clams as part of a family ritual. Shaw’s passion for angling shines clearly in this third of the book. The chapters on angling covered topics where I am the most inexperienced, and as a result I learned the most from them. In my life I’ve caught only a few trout and bass and a handful of crappies and other sunfish, many of which smelled like pond slime. I also developed the seemingly all too common idea that sunfish were the disappointments of pond fishing. I was thus pleasantly surprised to see that Hunt, Gather, Cook includes a whole chapter on bluegills and other panfish. Perhaps these sunfish are the dandelions of the fish world — common, unassuming, but worthwhile when prepared correctly. After reading the chapter I have to admit: the oil-poached bluegill salad with summer veggies sounds divine — about five tiers above the “overcooked-backcountry-crappie-in-a-pan” that I prepared five or six years ago. Shaw’s is a recipe I can really see myself making. 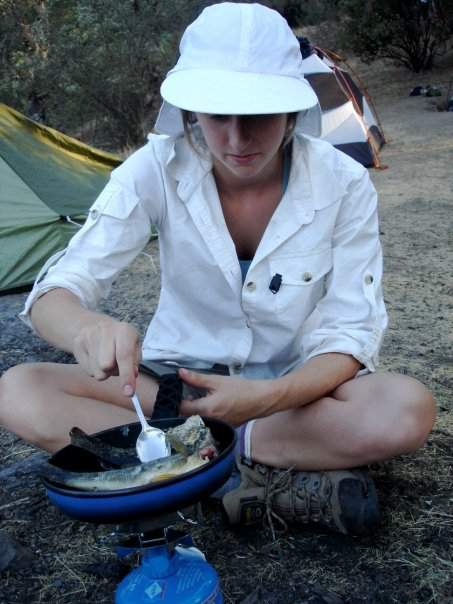 Backcountry crappie in a pan with no other ingredients. Edible, but you can do better. In addition to the joys of sunfish, Shaw’s chapters on fish were full of surprises. I learned that sea robins look like flying gargoyles and that oyster toads are not, in fact, toads at all. I also gained a sense of what I would need to do (and invest) to progress beyond fishing for small trout, bass, and other pond dwellers. Just as with hunting, fishing gear choices in many ways dictate what you can catch. Shaw lays out these instructional tips about gear and preparation nicely. He provides a brief introduction in his opening chapter “Why Fish?” and then discusses specific requirements and strategies across individual chapters on shellfish, bluegills and friends, crabs, herring and shad, bottom dwellers, and a final group that he calls “the misfits”. Shaw appears to have a great appreciation for culinary diversity and finding nourishment in unexpected places. The final third of Hunt, Gather, Cook focuses on hunting. The first few pages in this section are a mixture of personal philosophy, food ethics, and reflections on the way that hunting shapes our outdoor experiences. Though his treatment of these topics are brief, his respect and thoughtfulness are crystal clear. These themes permeate the stories of his first and most memorable hunts that open each subsequent chapter. Shaw’s perspective aligns exceptionally well with that of Modern Hunters. For example, we believe in the import of showing respect to an animal through utilizing it as completely as possible. 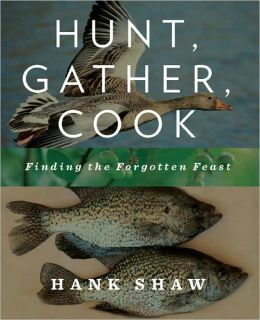 In line with this, Shaw consistently emphasizes the use of the whole animal throughout his book, including recipes for liver sausage and tongue carnitas, as well as uses for things like duck feet and animal fat typically discarded by hunters. As in the angling section, Shaw covers very basic gear requirements in the first hunting chapter and details game-specific suggestions in separate chapters. While you won’t be able to read the rabbits chapter and go out the next day fully ready to bag your first bunny, that is not what Hunt, Gather, Cook is for. The true strength of the hunting section is derived largely from Shaw’s clear explanations of what to do with your animal once you kill it. Tips on skinning, gutting, hanging, aging, sectioning, and cooking are all fine tuned to optimize the culinary result at the end. They are well worth listening to. His chapter on deer and other cervids is the least detailed in this regard, his chapters on upland game and waterfowl the most. Did you know that hanging a whole, completely unprocessed dead pheasant for days on end might actually be a good thing? Neither did I. 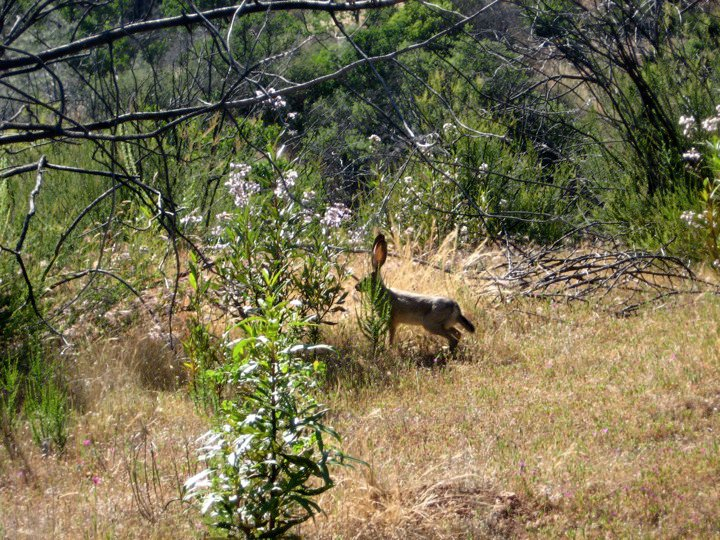 Small game, like jackrabbit (hare) is a great place for a beginning hunter to start. *Hunt, Gather, Cook* includes detailed instructions on how to break down and cook these animals, too. Overall, Hunt, Gather, Cook provides a little something for everybody. For those who cling tightly to the grocery store but are curious about wild culinary adventures, Shaw offers passionate, relatable inspiration. Incorporating wild food into your diet may be more accessible than you think. For beginner foragers, anglers, and hunters, Shaw gives us a glimpse of what’s out there and what would be involved in pursuing it. Natures bounty is so enormous and diverse that it’s foolish to think that we could master it all at once. Reading Hunt, Gather, Cook gives a survey of the primary options available in North America so that newbies can hone in on one or two things to start with. A beginner could walk away from Shaw’s book with a good idea of what type of hunting, fishing, and gathering appeals to them and their resources. For those already achieving success and bounty in gathering, hunting, or fishing endeavors, Hunt, Gather, Cook is sprinkled with creative cooking ideas. Many seem a bit fancy or labor intensive for a busy student like me. But while all are artful and creative, not all of Shaw’s wild food preparations are complex or require special culinary skill. Acorn flatbread requires only five ingredients, elderberry liqueur only four. Cured meats like duck confit or air-cured boar loin are daunting, but buttermilk fried rabbit is doable. For a relatively inexperienced and sometimes lazy chef like myself, these simpler recipes were a welcome relief and kept me engaged throughout. By the same token, one might complain that the recipes in Hunt, Gather, Cook are too limited — typically only three or four per chapter (about fifty total in the entire book). Surely no forager or angler would want to rely on these recipes alone, and anyone exclusively seeking a comprehensive wild game recipe book is going to feel short changed. But to look at Hunt, Gather, Cook in this way would miss the point. I think of this book as an appetizer to the wild game buffet that is Shaw’s website, honest-food.net. Pair these together and you’ll have a winning combination. My highest recommendation goes to Hunt, Gather, Cook. A part how-to, part recipe collection, part manifesto on wild food is probably not easy to pull off, but Hank Shaw does it well. For other Modern Hunters book reviews, visit our recommended hunting reads. All opinions are my own. All items I review, books included, were purchased by me. And through Hank I found your blog. Thanks for doing this! You have a great site full of useful information for novices and would-be hunters.